When you meet Dr Panyarit his enthusiasm is quite infectious, especially when talking about PRP. This treatment is now available from him at Pattaya International Hospital. In simple terms PRP application is a procedure whereby blood is taken from the patient. Then a centrifuge machine is used to separate the red and white blood cells extracting the Platelet Rich Plasma. This is then injected back into the patient’s body where it is most needed. Dr Panyarit tells me that this therapy is extremely effective in the treatment of Osteoarthritis, Tendinitis, Tennis Elbow, Lower back pain Joint Repair, Ligament sprain and chronic muscle sprain.lt is relatively painless and there is literally no down time as patients literally walk out after the procedure and generally notice decreased pain and improved range of motion within three weeks. We also discuss something that most of us will experience as we get older, that of problems with our knees. This can often be caused by the cartilage that cushions the knee joints wearing away. Previously the only treatment offered for this was a series of cortisone injections but cortisone doesn’t treat the problem it only treats the inflammation. PRP however can actually start the regeneration process, actually improving and growing cartilage. 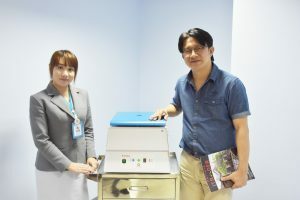 Pattaya International uses the very best machines from Taiwan, leaders in this relatively new field of regenerative medicine. The hospital itself is very forward thinking and offers many new treatments especially important for the complaints of the aging population. I was also interested to find out when Dr Panyarit first decided to become a doctor ? He told be that as a child he wanted to learn how to do everything and was interested to know how to heal and how to treat people. After attending Chiang Mai University he trained in the Orthopedic department of the Siriraj hospital in Bangkok and has now been at Pattaya International Hospital for 10 years. He certainly is one of the Hospital’s Superstars with a real enthusiasm and love of •Wil -what he does and he is very keen to share information. So much so that as we were travelling from the ward down to the ground floor reception in the lift, he showed me on his phone an x-ray photo of a knee replacement surgery . Very proudly he declared that it was the surgery he had performed that very morning – a Dr that certainly loves his work!